How different would my life be if I had never seen Star Trek? The question occurred to me because recently — in a fit of nostalgia, or out of a simple desire to have something to watch on the TV at 11 pm, when I’m too tired to read, and not quite sleepy enough to close my eyes — I bought the latest, and last, Star Trek series on DVD. I write that word “mission” in quotes, because it seems that Humanity’s new starship has no mission except to fly around looking for something interesting to do. They’re like teenagers who just got a driver’s license: they’re cruising, out for trouble. It’s hardly great television, but it makes me chuckle, and somehow warms the heart. Never a “Trekkie” or even a “Trekker,” the original Star Trek series nonetheless had a deeply formative influence on my teenage life. I watched the show, in re-run then, every day after school for who-knows-how-many years. Televisions took a while to warm up back then (1970s), the sound usually coming on before the picture. It happened often that I turned on in mid-episode, heard about 5 seconds of background music … and knew exactly which episode was on. I dreamt, often, that I was Captain Kirk. I know that to a modern ear, my youthful immersion in Star Trek lore sounds a little, well, pathetic. But back then, it was not so nerdy, especially in Florida, in eyeshot of the moonshots. Saturn V rockets used to make our windows rattle. Half the boys I knew dreamt of becoming astronauts, during some phase of their young lives. 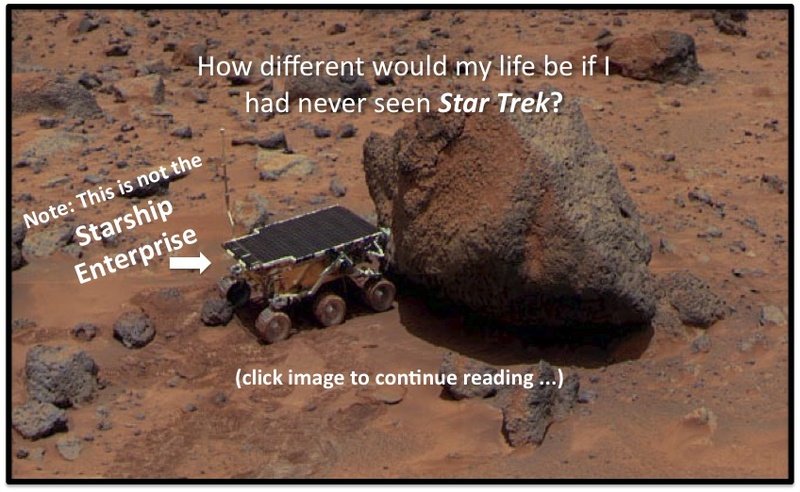 Which brings me back to my question: would my life be any different, had I not grown up watching Star Trek and dreaming about travel between the stars, meeting alien cultures, exploring an ever-expanding horizon of scientific and cross-cultural mystery? Contrast that question with, say, a similar one about James Joyce’s Ulysses: how different would my life be if I had not read this masterwork of 20th Century literature? I did love the book, particularly its closing section, but I cannot say that it has had any formative influence on my personality that I can detect, other than contributing to a vaguely modernist (and post-modernist) worldview and love of language that more properly belongs to the whole of literature, rather than any specific work. But Star Trek … well, that was more like Ulysses of the Homeric tradition. It was a formative myth. It captured, and amplified, a deeply felt longing, one that had nothing to do with spaceships. The myth of Star Trek had to do with learning, growing, expanding one’s consciousness and capability, overcoming adversity, taking chances, making your own destiny by sheer force of will and imagination. These have all been central themes in my life, as they are in most people’s lives. In my case, they have been tightly coupled to a life-long quest to make a positive difference, and a contribution to the changes we call “sustainable development.” I have no idea whether watching Star Trek made me more predisposed to travel off to other countries, early in my life, and try to learn about those cultures by immersing myself in them. I don’t know how much it added to my seemingly in-born desire to make change, promote innovation, facilitate improvement. But it is not an unreasonable question to ask, if I hadn’t watched Star Trek, would I have made the same choices in life along the way? I’ll never know the answer to that question for sure — life has no counterfactuals, as they say — but I have my suspicions. Watching Star Trek now — whether the Enterprise series, or the J.J. Abrams’ relaunch film of a few years back, which seemed aimed at twenty-somethings — is still fun, but it’s fun in a nostalgic sort of way. It’s like looking at a family photo album: it helps me remember how I got here. My own Ulysses adventure ultimately led me to a very different life, in Sweden. While I still enjoy traveling and exploring, in connection with my work on sustainable development, I no longer long for it. There’s a home, hearth, family and children in my life now. These fully claim all my capacity for longing, whenever I’m away from them. But that sense of mission persists. In the end, the Humans of Star Trek are really just trying to make the Universe a better, safer place for kids to grow up in. Sounds like sustainability work to me.